Hi, Friends! 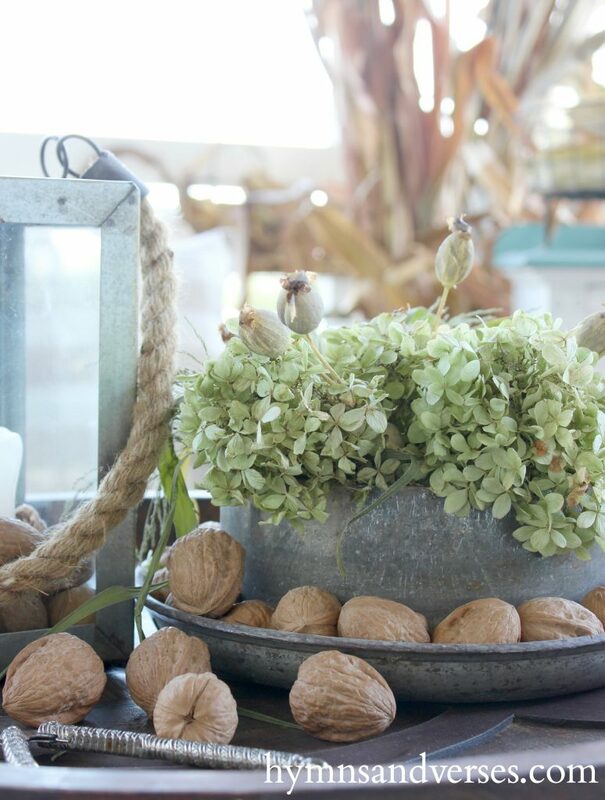 Let’s begin this week early with some Farmhouse Fall Accents! Today, I’ve joined seven of my blogging friends to share how we add fall accents into our own individual farmhouse style! 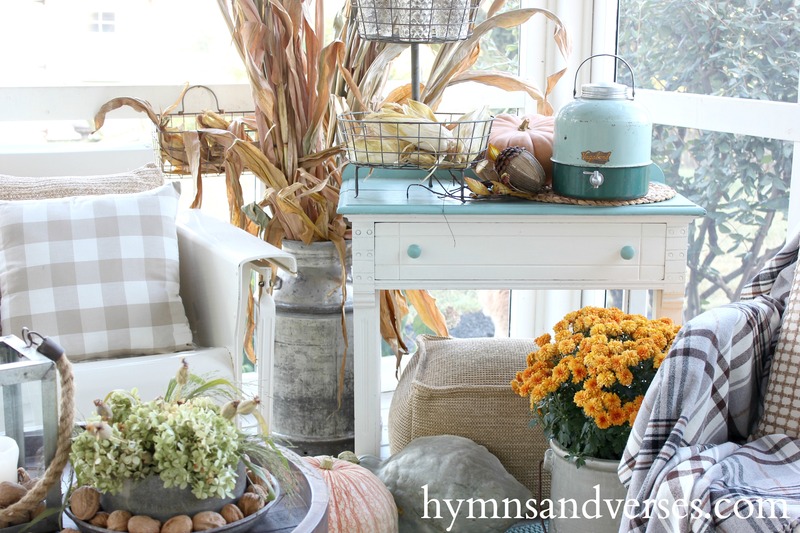 So, are you ready to see a little bit of autumn and farmhouse on the porch? When I think about my own farmhouse style, I can see how it correlates with my own memories. Days spent with my grandmother on the farm, in her “real” farmhouse, and I got to live right next door! Grandma had a small, screened-in porch with a glider – that was not vintage at the time! Oh, the days I spent gathering up walnuts from the huge walnut trees. Grandpa loved those walnuts! He would sit in his chair, after a hard day’s work, and crack walnuts to eat. I don’t care much for them, except in cookies!! But, don’t they look pretty with the vintage nut cracker! I’m so glad I have a milk can from the farm. I don’t use it all the time in my decor, but I decided to bring it on the porch for fall this year. 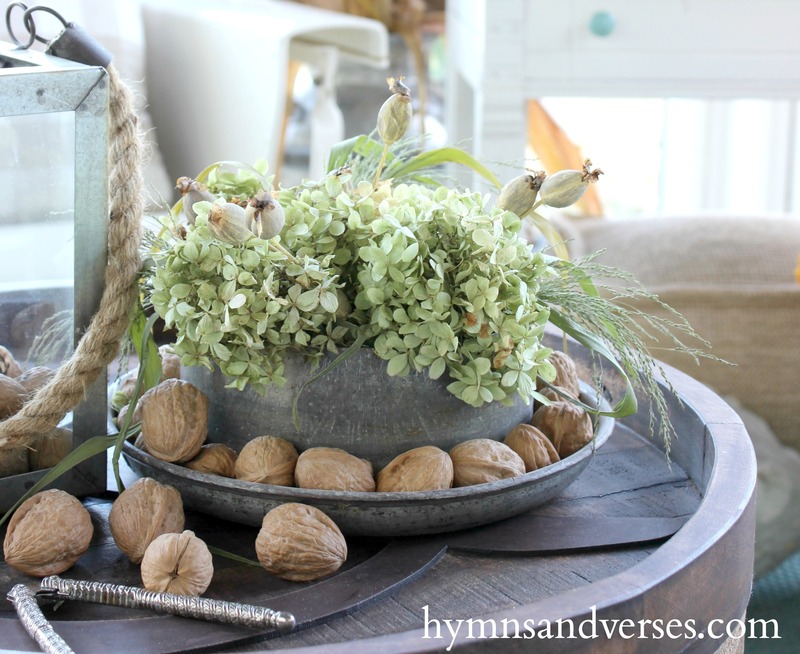 The lid makes a great holder for some hydrangea and seed pods. For the milk can itself, I filled it with corn shocks from the farmer’s field – well, actually, I bought them!! I had to cut quite a bit off the corn shocks, because they were so tall! But, like my grandmother always said – let nothing go to waste! 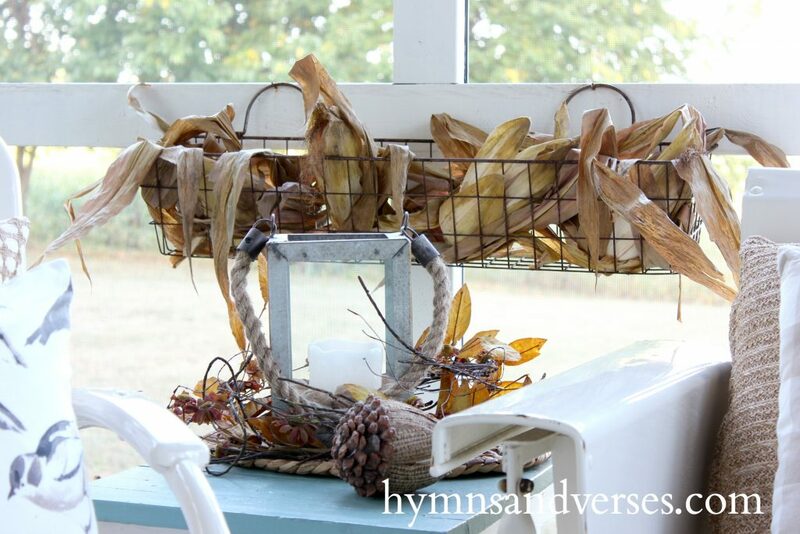 So, I used pieces of corn husks and the ears of corn to fill in my wire window baskets. When you live on a dairy farm, one of your main crops is usually field corn. It’s a staple of a dairy cow’s diet! We didn’t have corn mazes back then, but oh the fun we had chasing each other in the rows upon rows of corn. Of course, there were always apples picked from the tree and pumpkins from the garden that were made into the most delicious pies by grandma! And, colorful mums planted in grandma’s flower beds. Autumn is a season to slow down. Why not dig out your family albums and reminisce a bit, like I did today! I hope you’ve enjoyed hanging out with me today on the porch! Below are the links that will take you to see more farmhouse fall accents by some of my favorite bloggers! Give them a big farmhouse hello from me while you are there! Such sweet memories, Doreen. They made me think of my grandparents down in Georgia. They had a HUGE walnut tree in the their backyard, which was where the tire swing was located. 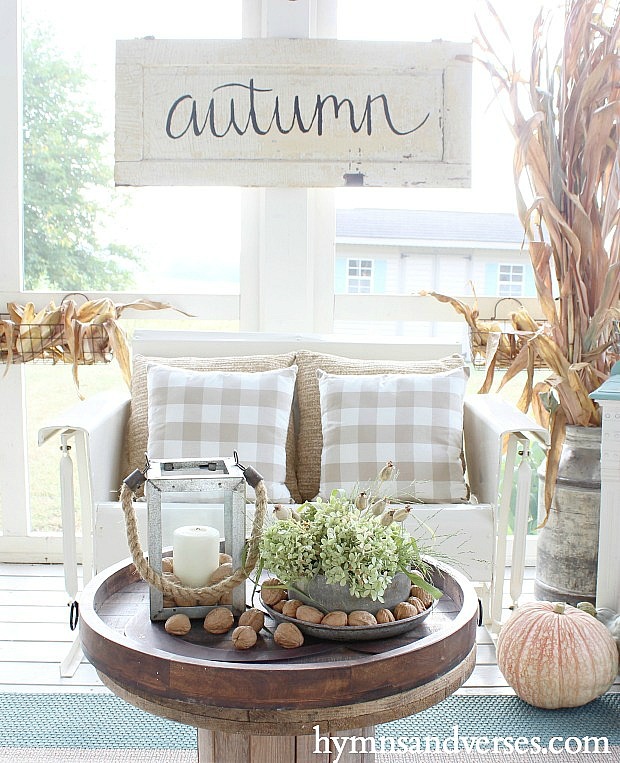 Your porch is amazing all dressed up for fall! Those memories are priceless, aren’t they? Your porch is so pretty, Doreen, and I love the autumn sign and the old milk can – what a treasure! Thanks for joining us for Farmhouse Fall Accents! Your porch is awesome, but the memories are even better. I love to hear stories like this, they are what make a house a home! Have a wonderful fall enjoying this gorgeous space! 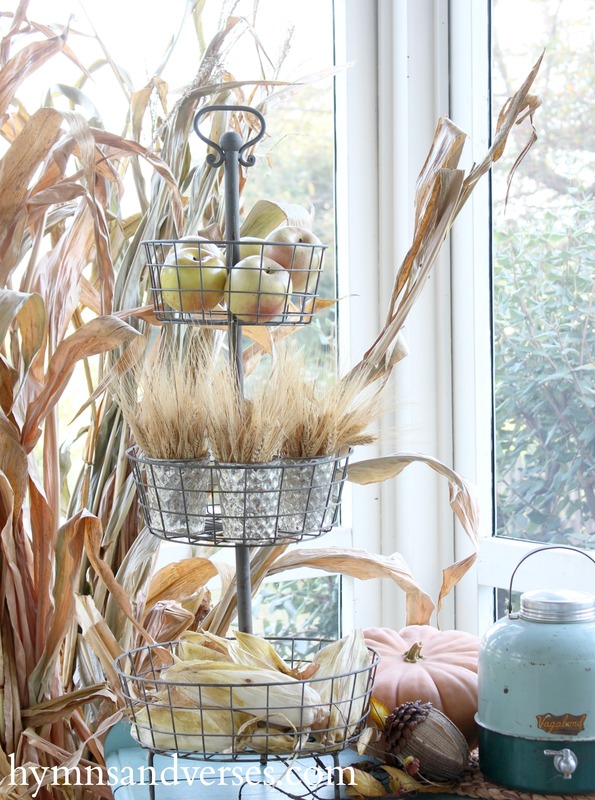 Thanks for inspiration to start fall decorating this weekend! My story is similar to yours: I lived alongside my grandparents’s dairy farm as a child and I use one of their milk cans to decorate. I can’t wait to put corn shocks this year! I love how you’ve decorated the porch for fall! It looks so welcoming and ready for all that goes with the fall season. Thanks for sharing….happy fall! Your porch looks so pretty and inviting. I too was raised on my grandparents dairy farm! They lived in the big farmhouse and we lived in the little house that was a converted chicken house. Such great shared memories of field corn, milk cans and porches, Did your grandparents bring in the tallest corn stalks and “measure” you against them? Mine did that every fall when I was little.My grandpa “Pappy” had a sweet tooth and my mom would bake him any pie he wanted. He’d go to the orchard and pick what was in season and bring it to her. My mouth still waters with that memory. Happy fall? I love your milk can filled with corn shocks. My grandparents had rows of corn, which I only remember as being hot in summer with those tall shocks blocking the breezes. My porch is too small to really add warmth. I wish I could have a black rocker with plaid throw draped over it. Oh so pretty and so inviting. I think I would live out there. Doreen, I love your farmhouse memories. My grandparents were farmers so autumn is truly all about the harvest. Love every detail of your porch decorations! I grew up on a farm and I, too, loved running through the rows of corn, hiding from my siblings and neighbor friends. Very beautiful! I love the natural elements. 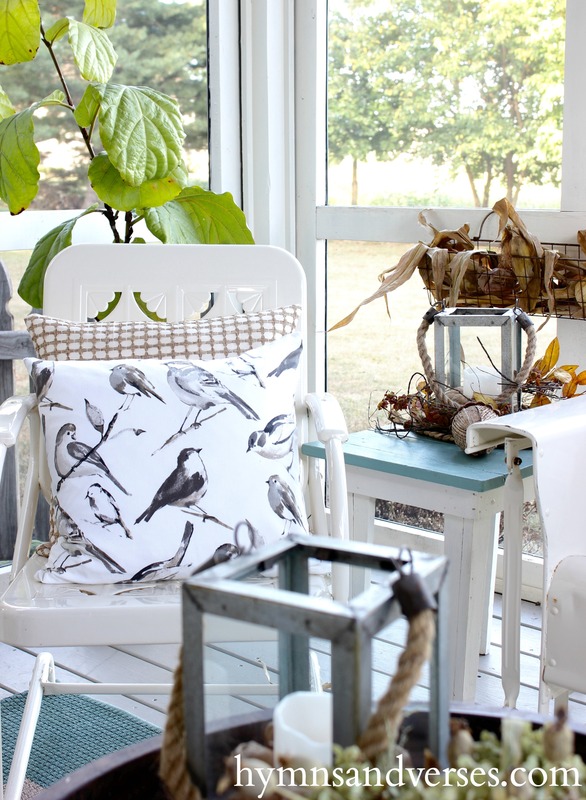 The story and how you decorated your porch go so hand in hand. Beautiful as always! 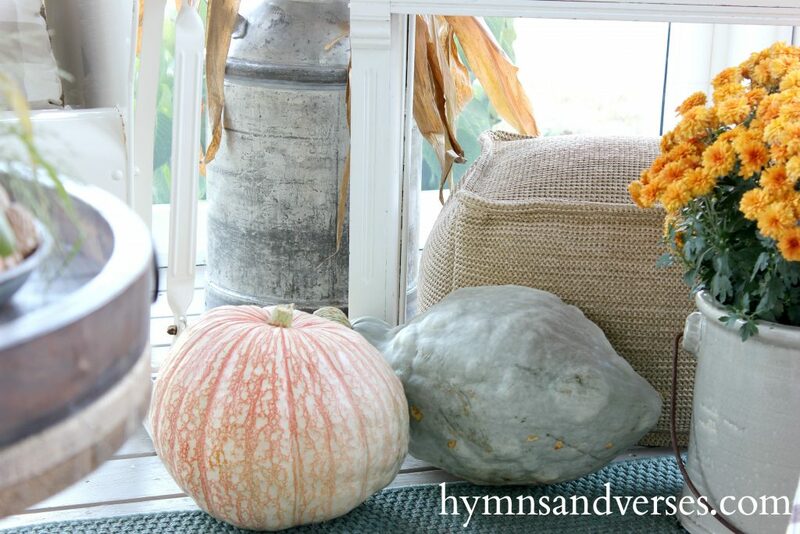 Your fall decor is beautiful, and I pinned it to my Pinterest board, Fall. We would love for you to share this post and others each week at our new linky party, Monday Social. The party is still live on my blog at http://botanicbleu.blogspot.com/2016/09/monday-social-1a.html You can link photos from Instagram, Pinterest, and Facebook, as well as a Blog. It is still hot, hot, hot in north Texas, but signs of Fall like yours are popping up all across blogland making promises that Fall is coming. Your blog is stunning, I loved meeting you through this blog hop and I just adore your heart for God and the way you are ministering to women here. Bless you! I spot that Mary & Martha tray. Love it. I’ve always thought that making the porch into a 2nd or 3rd living area is an easy way to add space for the extra guests the fall brings. Thanks for the walk down memory lane. I spent summers with my Grandparents on the farm. Even as an adult I would take my children down every summer. They also spent time running through the corn fields and picking green beans. I still have that house but SAD to say the town is taking it for a road. Progress so they say!!! But I will always have my wonderful memories.